The Seventh Amendment (Amendment VII) to the United States Constitution is part of the Bill of Rights. This amendment codifies the right to a jury trial in certain civil cases and inhibits courts from overturning a jury's findings of fact. An early version of the Seventh Amendment was introduced in Congress in 1789 by James Madison, along with the other amendments, in response to Anti-Federalist objections to the new Constitution. Congress proposed a revised version of the Seventh Amendment to the states on September 28, 1789, and by December 15, 1791, the necessary three-quarters of the states had ratified it. Secretary of State Thomas Jefferson announced the adoption of the amendment on March 1, 1792. The Seventh Amendment is generally considered one of the more straightforward amendments of the Bill of Rights. While the Seventh Amendment's provision for jury trials in civil cases has never been incorporated (i.e., applied to the states) almost every state voluntarily complies with this requirement. The prohibition of overturning a jury's findings of fact applies to federal cases, state cases involving federal law, and to review of state cases by federal courts. United States v. Wonson (1812) established the historical test, which interpreted the amendment as relying on English common law to determine whether a jury trial was necessary in a civil suit. The amendment thus does not guarantee trial by jury in cases under maritime law, in lawsuits against the government itself, and for many parts of patent claims. In all other cases, the jury can be waived by consent of the parties. After several years of comparatively weak government under the Articles of Confederation, a Constitutional Convention in Philadelphia proposed a new constitution on September 17, 1787, featuring a stronger chief executive and other changes. George Mason, a Constitutional Convention delegate and the drafter of Virginia's Declaration of Rights, proposed that a bill of rights listing and guaranteeing civil liberties be included. Other delegates—including future Bill of Rights drafter James Madison—disagreed, arguing that existing state guarantees of civil liberties were sufficient and that any attempt to enumerate individual rights risked implying that the federal government had power to violate every other right (this concern eventually led to the Ninth and Tenth Amendments). After a brief debate, Mason's proposal was defeated by a unanimous vote of the state delegations. In the final days of the convention, North Carolina delegate Hugh Williamson proposed a guarantee of trial by jury in federal civil cases, but a motion to add this guarantee was also defeated. However, adoption of the Constitution required that nine of the thirteen states ratify it in state conventions. Opposition to ratification ("Anti-Federalism") was partly based on the Constitution's lack of adequate guarantees for civil liberties. Supporters of the Constitution in states where popular sentiment was against ratification (including Virginia, Massachusetts, and New York) successfully proposed that their state conventions both ratify the Constitution and call for the addition of a bill of rights. One charge of the Anti-Federalists was that giving the U.S. Supreme Court jurisdiction "both as to law and fact" would allow it to deny the findings of jury trials in civil cases. Responding to these concerns, five state ratification conventions recommended a constitutional amendment guaranteeing the right to jury trial in civil cases. 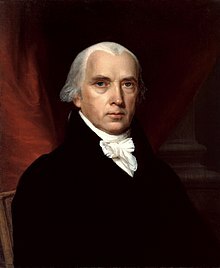 In the 1st United States Congress, following the state legislatures' request, James Madison proposed twenty constitutional amendments based on state bills of rights and English sources such as the Bill of Rights 1689. Among them was an amendment protecting findings of fact in civil cases exceeding a certain dollar value from judicial review. 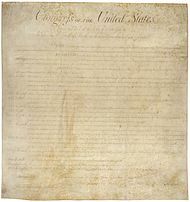 Madison proposed that this amendment should be added directly to Article III, though Congress later determined to add the proposed Bill of Rights to the end of the Constitution, leaving the original text intact. Congress also reduced Madison's proposed twenty amendments to twelve, and these were proposed to the states for ratification on September 25, 1789. By the time the Bill of Rights was submitted to the states for ratification, opinions had shifted in both parties. Many Federalists, who had previously opposed a Bill of Rights, now supported the Bill as a means of silencing the Anti-Federalists' most effective criticism. Many Anti-Federalists, in contrast, now opposed it, realizing that the Bill's adoption would greatly lessen the chances of a second constitutional convention, which they desired. Anti-Federalists such as Richard Henry Lee also argued that the Bill left the most objectionable portions of the Constitution, such as the federal judiciary and direct taxation, intact. In February through June 1790, New York, Pennsylvania, and Rhode Island ratified eleven of the amendments, though all three rejected the amendment on Congressional pay raises. Virginia initially postponed its debate, but after Vermont was admitted to the Union in 1791, the total number of states needed for ratification rose to eleven. Vermont ratified on November 3, 1791, approving all twelve amendments, and Virginia finally followed on December 15, 1791. Secretary of State Thomas Jefferson announced the adoption of the ten successfully ratified amendments on March 1, 1792. The Seventh Amendment is generally considered one of the more straightforward amendments of the Bill of Rights. Scholar Charles W. Wolfram states that it has usually "been interpreted as if it were virtually a self-explanatory provision". Unlike most of the provisions of the Bill of Rights, the Seventh Amendment has never been applied to the states. The Supreme Court stated in Walker v. Sauvinet (1875), Minneapolis & St. Louis Railroad v. Bombolis (1916) and Hardware Dealers' Mut. Fire Ins. Co. of Wisconsin v. Glidden Co. (1931) that states were not required to provide jury trials in civil cases. Nonetheless, most states voluntarily guarantee the right to a civil jury trial, and they must do so in certain state court cases that are decided under federal law. Justice Joseph Story issued the first judicial opinion on the amendment in United States v. Wonson (1812). Beyond all question, the common law here alluded to is not the common law of any individual state, (for it probably differs in all), but it is the common law of England, the grand reservoir of all our jurisprudence. It cannot be necessary for me to expound the grounds of this opinion, because they must be obvious to every person acquainted with the history of the law. Wonson's ruling established the historical test, which interpreted the amendment as relying on English common law to determine whether a jury trial was necessary in a civil suit. Applying the historical test in Parsons v. Bedford (1830), for example, the Supreme Court found that jury trials were not constitutionally guaranteed for cases under maritime law, an area in which English common law did not require juries. The Court further clarified this rule as a fixed historical test in Thompson v. Utah (1898), which established that the relevant guide was English common law of 1791, rather than that of the present day. In Chauffeurs, Teamsters, and Helpers Local No. 391 v. Terry (1990), the Court explained that the right to a jury trial provided by the Seventh Amendment encompasses more than the common law forms of action recognized in 1791 (when the Bill of Rights was ratified), but rather any lawsuit in which parties' legal rights were to be determined, as opposed to suits that only involve equitable rights and remedies. In Galloway v. United States (1943), the Court permitted a directed verdict (a verdict ordered by a judge on the basis of overwhelming lack of evidence) in a civil suit, finding that it did not violate the Seventh Amendment under the fixed historical test. The Court extended the amendment's guarantees in Beacon Theatres v. Westover (1959) and Dairy Queen, Inc. v. Wood (1962), ruling in each case that all issues that required trial by jury under English common law also required trial by jury under the Seventh Amendment. This guarantee was also further extended to shareholder suits in Ross v. Bernhard (1970) and to copyright infringement lawsuits in Feltner v. Columbia Pictures TV (1998). In Markman v. Westview Instruments, Inc. (1996), the Court ruled that many parts of patent claims are questions of law rather than of fact, and that the Seventh Amendment guarantee of a jury trial therefore does not necessarily apply. Lawsuits against the federal government itself do not receive Seventh Amendment protections due to the doctrine of sovereign immunity. In Lehman v. Nakshian (1981), the Court ruled that citizens may sue the federal government only in cases where such right has been granted by act of Congress. The Supreme Court has held that the Seventh Amendment's guarantee of a jury trial also guarantees a jury of sufficient size. The Court found a six-member jury sufficient to meet the amendment's requirements in Colgrove v. Battin (1973). Congress has never extended federal diversity jurisdiction to amounts that small. Under federal law (28 U.S.C. §1332), the amount in dispute must exceed $75,000 for a case to be heard in federal court based on diversity of the parties' citizenship (the parties are from different states or different countries). However, civil cases may arise in federal court that are not diversity cases (e.g., in places like the District of Columbia that are federal jurisdictions), in which case the Twenty Dollars Clause may apply. The Re-Examination Clause of the Seventh Amendment states: "In suits at common law, ... no fact tried by jury, shall be otherwise reexamined in any Court of the United States, than according to the rules of the common law." This clause forbids any court from reexamining or overturning any factual determinations made by a jury guaranteeing that facts decided by that jury cannot be reexamined at a later date. Exceptions to this prohibition are possible if it is later determined that legal errors were made or evidence submitted was insufficient in some way. In such cases the reexamination is conducted by another jury so that the decision is still left in the hands of the people. The clause applies only to cases where private rights—i.e., rights that exist between private citizens—have been violated. The Re-Examination Clause applies not only to federal courts, but also to "a case tried before a jury in a state court and brought to the Supreme Court on appeal." Justice Samuel Nelson wrote the opinion of the Supreme Court in The Justices v. Murray, 76 U.S. 9 Wall. 274 (1869), in which he quoted Justice Joseph Story to explain the modes to reexamine facts tried by juries according to common law: "Mr. Justice Story […] referring to this part of the amendment, observed […] that it was 'a prohibition to the courts of the United States to re-examine any facts tried by a jury in any other manner [than according to Common Law].' […] He further observed that 'the only modes known to the common law to re-examine such facts was the granting of a new trial by the court where the issue was tried, or the award of a venire facias de novo, by the appellate court, for some error of law that had intervened in the proceedings.'" As common law provided, the judge could set aside (or nullify) a jury verdict when the judge decided that the verdict was contrary to the evidence or the law. Common law precluded the judge from himself entering a verdict; a new trial, with a new jury, was the only course permissible. In Slocum v. New York Insurance Co. (1913), the Supreme Court upheld this rule. Later cases have undermined Slocum, but generally only when the evidence is overwhelming, or if a specific law provides narrow guidelines by which there can be no reasonable question as to the required outcome, may the court enter "judgment as a matter of law" or otherwise set aside the jury's findings. ^ All three states later ratified the Bill of Rights for sesquicentennial celebrations in 1939. ^ a b "The Justices v. Murray 76 U.S. 274 (1869)". Justia U.S. Supreme Court Center. Justia U.S. Supreme Court Center. Retrieved 13 January 2015. ^ United States Government Printing Office. "SEVENTH AMENDMENT ---- CIVIL TRIALS ---- CONTENTS" (PDF). gpo.gov. ^ "CRS Annotated Constitution". Legal Information Institute, Cornell Law School. Retrieved October 17, 2013. ^ a b c d Mahoney, Dennis J. (1986). "Seventh Amendment". Encyclopedia of the American Constitution. Archived from the original on 2013-11-05. Retrieved August 20, 2013. ^ a b c d Levy, Leonard W. (1986). "Bill of Rights (United States)". Encyclopedia of the American Constitution. – via HighBeam Research (subscription required). Archived from the original on 2013-09-21. Retrieved July 16, 2013. ^ a b c d e f "Seventh Amendment". Constitutional Amendments. – via HighBeam Research (subscription required). January 1, 2008. Archived from the original on November 5, 2013. Retrieved August 21, 2013. ^ Moses, Margaret. "What the Jury Must Hear: The Supreme Court's Evolving Seventh Amendment Jurisprudence", George Washington Law Review, Vol. 68, p. 185 (2000) (in "the two states where the civil jury trial right is not constitutionally based, it is nonetheless provided either by statute or court rule"). See generally West Virginia Constitution, art. III (using a threshold amount of twenty dollars as in the U.S. Constitution). ^ Dice v. Akron, C. & Y. R.R., 342 U.S. 359 (1952). ^ "The Twenty Dollars Clause". The Harvard Law Review. March 1, 2005. Retrieved August 21, 2013 – via Questia Online Library. ^ Hamburger, Philip. "The Constitution's Accommodation of Social Change", Michigan Law Review, Vol. 88, pp. 296-97 (1989). ^ Capital Traction Co. v. Hof, 174 U.S. 1 (1899). ^ "The First Ten Amendments or The Bill of Rights". Revolutionary War and Beyond. Retrieved 13 January 2015. ^ a b c "The 7th Amendment". Revolutionary War and Beyond. Retrieved 13 January 2015. ^ "The Constitution of the United States of America: Analysis, and Interpretation - 1992 Edition --> Amendments to the Constitution --> Seventh Amendment - Civil Trials". U.S. Government Printing Office. U.S. Government Printing Office. 1992. p. 1464. Retrieved 4 July 2013. Baicker-McKee, Steven; William M. Janssen; and John B. Corr (2008) . A Student's Guide to the Federal Rules of Civil Procedure. Thomson West. Beeman, Richard (2009). Plain, Honest Men: The Making of the American Constitution. Random House. Labunski, Richard E. (2006). James Madison and the struggle for the Bill of Rights. Oxford University Press. Levy, Leonard Williams (1995). Seasoned Judgments: The American Constitution, Rights, and History. Transaction Publishers. Maier, Pauline (2010). Ratification: The People Debate the Constitution, 1787–1788. Simon and Schuster. Wolfram, Charles W. (1973). "The Constitutional History of the Seventh Amendment", 57 Minnesota Law Review 639, 670-71.